Power and performance are guaranteed from the exceptional value Mountfield 2248H lawn tractor. Powered by a 22hp Briggs and Stratton twin cylinder Intek engine, the 2248 has infinitely variable hydrostatic transmission to deliver smooth and controllable drive to the wheels. The 122cm/48 inch cutting deck has twin contra-rotating blades and electronic engagement. Grass clippings are ejected cleanly and efficiently into the 320 litre collector. An audible alarm activates when the collector is full, automatically resetting once it has been emptied. When conditions are suitable, collection and disposal of grass clippings can be eliminated by fitting the mulching kit supplied as standard. As with all models in the Mountfield lawn tractor range, operator comfort is given a high priority. The control levers and pedals on the 2248H are located in easy reach of the driving position. The high back comfort seat is fully adjustable and the steering console features an illuminated diagnostic display. A tow bar is fitted to the Mountfield 2248H as standard, enabling a large range of optional accessories to be used. 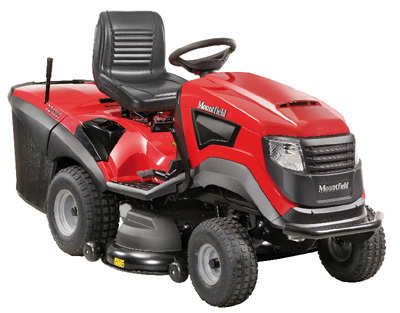 The Mountfield 2248H is ideal for areas of up to five acres and will handle both fine lawns and unruly paddocks delivering unbeatable cutting performance. Norfolk and the WaveneyValley area of Suffolk, fully assembled, ready for use and personally delivered by one of our garden machinery specialists who will install the machine and take time to explain its operation. We provide full warranty, service and spare parts support for Mountfield equipment. As Mountfield dealers, we are responsible for all aspects of the sale and the contract governing the sale and support of Mountfield products. In view of this, we only supply Mountfield equipment to customers resident in Norfolk and the WaveneyValley area of Suffolk. We will consider part exchange of used garden equipment against the purchase of new Mountfield equipment. Already own a Mountfield machine and need a part? Contact us on 01603 738635 or 01362 699888.